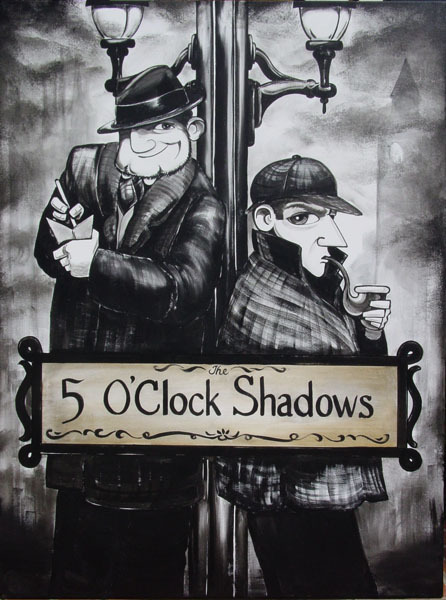 This painting on a 3 x 4 foot canvas is for a comedy act based on a couple of detective puppets. 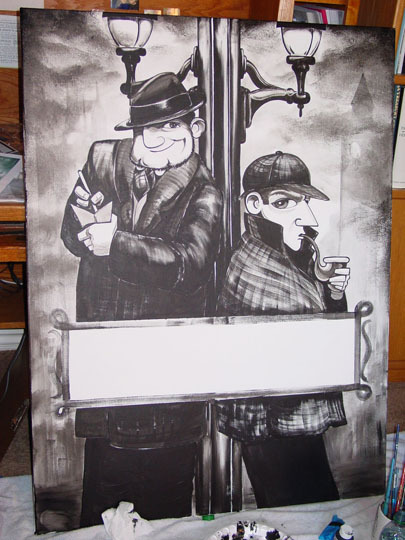 This painting is a caricaturization of the two guys that do the act will sit prominently on stage for all to see. 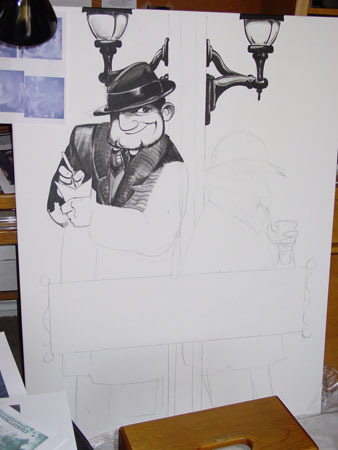 I’m including photos of my progress on this work. Just scroll down to see more. I especially like my daughter’s idea to use a sepia color in the name board. I tried a bronze that didn’t work and probably wouldn’t have been good with the lighting on stage. I’m very happy with the finished effect. Here you can see that I’m working on the floor of my studio. At this point, I’m only using Golden’s Black. Any white is just the canvas showing though. I chose to start on Eric’s face because I had the most trouble caricaturing him. When I finally got a sketch that I liked, I couldn’t wait to paint him. Just look at that mug…. I begin by drawing on paper, then sketching directly onto the canvas with artist charcoal. 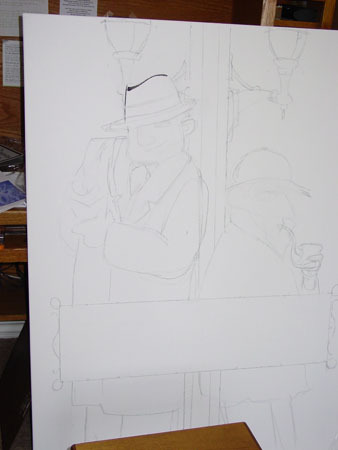 It’s easily erased using a wet cloth, but only for a couple of times, then the canvas starts getting muddy. I think the hardest part of any painting is that first stroke. I sit and look at my sketch for a long time before I jump in with that first sweep of wet paint. It’s like the first cut into a beautifully decorated cake. yummmm….make mine spice with chocolate covered strawberrys……but I digress.